Our Party Tents are great for parties, weddings, sporting events, outdoor vendors, and tradeshows. We have Greenhouses, Large Portable Buildings, and portable garages for autos, motorcycles, outdoor furniture and much more! Portable Greenhouses offer the gardener the very best in plant cultivation and protection space. Available in either House ridge style or Round Quonset hut style as you choose. Either style offers tremendous light diffusion through the high quality translucent fabric for great growing. Extends your annual growing season by 2-3months. Grow It GreenhousesStart seedlings or extend your growing season with the Grow It Greenhouse . This easy to assemble, compact backyard greenhouse is constructed with a triple-layer, rip-stop cover. 100% waterproof and UV treated inside and out, our Clearview translucent cover provides protection from the elements outside and enhanced illumination inside. 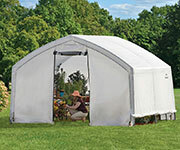 Designed specifically for plant growth, the cover blocks harmful UV rays and features a vented door and back panel for maximum airflow and ventilation when you need it. Portable Steel Carports offers two sizes of heavy duty open sided Steel Carports. Select either the larger car size unit or the smaller, shorter unit to fit your needs. These units are high quality protection from the effects of sun and weather for cars, trucks, machinery, recreational equipment or just about anything else that requires outdoor protection . Portable Instant GarageInstant Garages provide the best in instant, portable protection for any purpose. Typical uses include vehicle protection and storage equipment/material storage. The Peak style unit quickly sheds moisture, rain, or snow for maximum protection of the interior contents. The pre-drilled frame is easily assembled with minimal hand tools. No drilling or field cutting is required. All frame components are made from galvanized steel. Accelaframe Peck Greenhouse is unique frame comes as pre-assembled ribs that simply unfold and lock into place to create a building that has more strength than comparably-sized structures. Designed for plant growth and protection. Fabric - Covers and Doors are made of a 10 oz., industrial grade, rip-stop poly that is ultra-violet ray treated on both sides to prevent sunlight from deteriorating the covers. Rip-stop poly means if you were to get a tear in the cover, the rip will not continue. All outer colors have a white interior, which makes for a bright inside. Rhino Shelter fabric is flame-resistant and meets California fire code CPAI-84 as a safety feature to avoid emergencies. Most importantly, ALL Rhino Shelter instant garages have a special layer in between the outer and inner layers called an Inner Black Scrim. The Inner Black Scrim has a coating that blocks 100% sunlight from penetrating through the material.